Founded in the eleventh century, 'Novgorod the Great' is Russia's oldest city, first recorded in ninth-century chronicles. 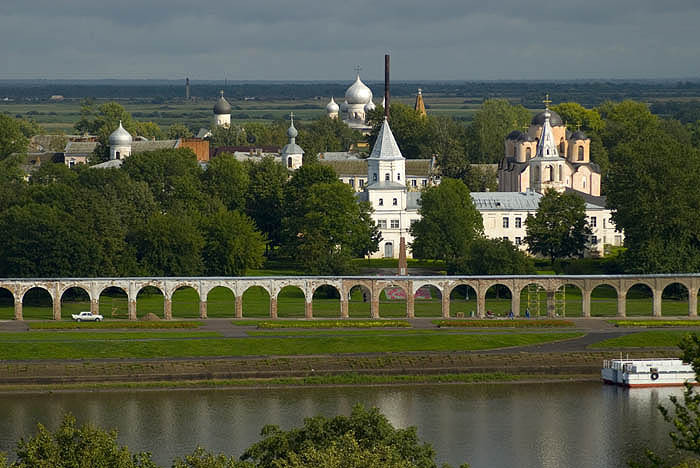 Novgorod today is a peaceful place whose brick Kremlin encloses a parkland of heritage churches and other structures. On the east bank of the Volkhov River, facing the Kremlin, is a medieval marketplace called Yaroslav's Court. Novgorod is three hours from St Petersburg and nine hours from Moscow by overnight train, but if I had not scrutinised my train ticket carefully I would have arrived instead in Nizhny Novgorod (formerly Gorky) a much larger city equally far from Moscow in the opposite direction!